Pancho M. Piano finished bchelors Degree in Economics at the University of Nueva Caceres (1978), and look a degree in Fine Arts at the University of the Philippines Diliman as a Jose Joya Scholar (1984-1987). 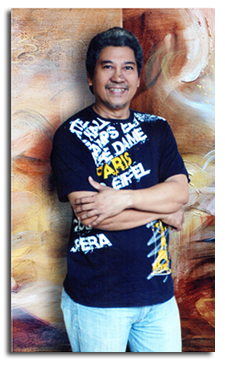 The first Filipino artist to exhibit Leather Art in the Philippines, Pancho has executed numerous murals and stained glass designs for civic and religious patrons in various cities and municipalities throughtout the Bicol region, such as Naga City, Daraga, Guinobatan, Camalig, Polanngui, Ligao, Pio Duran, Sto. Domingo, Legaspi City, Tabaco City, and Boracay; in Pampanga, Quezon City, Mandaluyong City, Pasig City, Caloocan City and the Mindanao region; as well as in Japan, Saipan and Palau. Pancho`s paintings and stained glass designs focus on Bicolano myths and traditions, most especially the Bicolano devotion to the Lady Peñafrancia. He has mounted more than thirty solo exhibitions and participated in over 50 grouped exhibitions, in the Philippines, Japan, Saipan, and the United States of America, France, Austria, the Federal Republic of Germany, Belgium, Italy, and Switzerland. Pancho has won over 10 major national competitions in the Philippines, including Finalist at the 1997 AFP Centennial Mural Painting Competition, and the 1998 AAP Centennial Painting Competition. Pancho was given Artist of the Year Awards for the total of twelve times by various Bicol institutions. Pancho Piano was also featured in television networks ABS-CBN, and his work has also been featured in 10 coffee table book publication. Recently, he was awarded as Most Outstanding Bicolano Artist 2009, My City My SM Award 2010 and Orgullo Kan Award for Visual Arts 2011.